Yesterday I blogged that most of the acquisitions in the Sports 2.0 world were smaller niche plays and none of the larger sports startups like a Yardbarker, Bleacher Report, SB Nation, or Citizen Sports. Well that changed today and you can cross Citizen Sports off the list as Yahoo plunked down a rumored 40+ million bucks to acquire Citizen Sports. Yahoo has just confirmed that it has signed a definitive agreement to acquire Citizen Sports . Citizen Sports has a range of products related to fantasy and real-life sports, most of which incorporate social features. 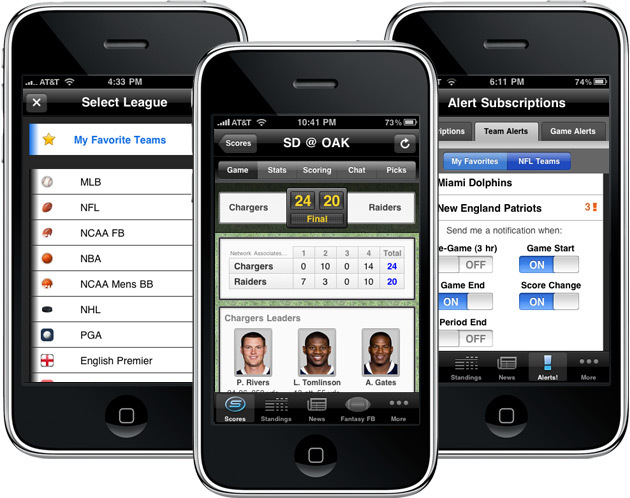 Along with web based leagues and applications on Facebook, the company also offers applications for the iPhone and Android. These applications will nicely complement Yahoo Sports, which offers a number of hugely popular fantasy sports leagues. Citizen Sports raised $10 million from Radar Ventures in 2005, when it was previously called Protrade. Frankly speaking I am pretty confident that they have raised more than $10 million dollars so this isn’t a home-run exit for the guys there but probably one they are very excited about and one their investors supported. Employee wise, one of their original founders is Jeff Ma which the book Bringing Down The House and the movie 21 was based off of. If you’re unfamiliar with the story, he was part of the MIT black jack team which used card counting and team communication to beat tons of casinos for large sums of money. Jeff is Asian but Hollywood whitewashed him for some reason. Jeff actually does a cameo in the movie. You could probably say writing a best selling book and selling your first startup to Yahoo for 40+ million is a nice way to start a career out of college. Jeff co founded the company with Mike Kerns who recently made SBJ’s 40 under 40. Mike seems to be in about every article in SBJ actually. I think he has a streak going of 5 straight issues and this is probably going to keep the streak going. What’s really interesting to me is if you rewind 2 years ago, Citizen Sports was actually far away from a significant exit and in the process of redefining itself. Initially founded as Pro Trade, a stock market to trade artificial stock in athletes (real money…. I still don’t conceptually get this), Citizen had not found a sustainable business model and their user base in the athlete stock market game was very modest although very active. Somewhere in 2008 they put the brakes on Pro Trade, rebranded, and started over again this time focusing on Facebook and mobile. Along the way they found sales partnerships with MLB and Sports Illustrated while building out a fleet of products in emerging areas. Actually feeling the pressure to nimbly transition to emerging areas that were getting competitive, Citizen went on an acquisition spree instead of ramping up engineering to enter a quickly growing space. The age old question of build vs. buy and Citizen bet the farm on buy and hoped that there new talent could deliver a fleet of products that would get wide-scale adoption. Looking back it was a smart move as the acquisitions were likely low cost and most probably mostly equity. The time it would take to ramp up hiring, define new products, and go to market would have taken at least 3-6 months at very least and maybe even a full year. Keep in mind that these 3 small development shops would have also been competitive with Citizen had they not bought them out and brought their talent in-house. Without these acquisitions the viability of Citizen Sports today might even be in question. The fact that these acquisitions took place in the first 60 days of the economic collapse is also telling. Perhaps their investors wanted a nimble change in direction or Citizen just saw opportunity to bring developers in house who didn’t have the stomach to go out and raise money/take the plunge to full time work on these projects with the headwinds of the economic collapse. On Facebook they built some of the first team specific Facebook communities in addition to developing social games on Facebook around March Madness and fantasy football. The fan communities were a little lacking in features and engagement, but installs weren’t a problem as FB users were fine bolting on a FB app that identified their team allegiances. The team communities also gave them a great install base to push their bracket challenges and fantasy sports applications which seemed to attract more casual sports fans who might not otherwise sign up at Espn.com or Yahoo. Suddenly Citizen Sports had users…. millions of them and sponsorable products to boot. The real genius came with their mobile strategy as Sportacular blossomed into the best sports news app on the Iphone and brought in another huge wave of users. Unlike some of the Facebook products, Sportacular was addictive and met a glaring need in the mobile space as fans were tired of using clunky mobile unfriendly websites to follow their favorite team. Sportacular most likely yielded 100K-250K in ad revenue a month although this is just a rough stab. A pay version of the product that eliminated the ads and had some additional features also helped pump some revenue into the company while the Facebook fantasy games and bracket apps turned the corner to become solid revenue yielding products. Despite all of this there hadn’t really been much buzz out there the past 9 months or so about Citizen so it wasn’t clear on the outside looking in just how well the company was doing. The new direction was working but it wasn’t evident just how effective it was and what the comapny’s revenue looked like. The Yahoo acquisition, especially the rumored price of 40-50 million, validates that indeed there was enough adoption, momentum, monetization going behind the scenes that warranted an acquisition from a larger media company. For Yahoo this makes sense although it seems a bit rich to me and that’s been the feedback that I’ve heard/seen. Yahoo has somewhat been engaging with ESPN in a digital holy war for a couple of years has actually moved well past ESPN in total audience and continued to make inroads with their blogs, Rivals network, and fantasy products. What they didn’t have was a mobile strategy or major FB presence. Bringing in Citizen Sports fills those expertise gaps. I guess the question now is how will the Citizen products change? Will Yahoo content now be pushed to users of the team communities and fantasy games as well on Sportacular? Most likely as Yahoo will look to gain users to their sports content by hooking into Citizen’s built in user base. Also what will become of Citizens fantasy games? Will they stay FB only or will Yahoo merge them with their fantasy games so you can play through Facebook as well as through Yahoo Sports. I’ll have to sleep on it as what I would do. Another caveat of this deal is that Citizen worked with MLB and SI through sales partnerships and now those relationships may be discontinued or simply run through Yahoo now. Considering Yahoo is very online advertising focused you may see them move away from these partners who will no longer have a mobile/Facebook offering. I think the last thing to consider here is that Yahoo just shelled out a lot of money for a mainly technology/web services offering. While its not a content acquisition like a Bloguin, SB Nation, Bleacher Report, or Yardbarker, its hard to imagine them shelling out major bucks to do another sports acquisition anytime soon. I could be wrong, but I don’t know if Carol Bartz wants to attach herself to multiple sports acquisitions with these type of hefty price tags. Yahoo still isn’t too far removed from the Rivals acquisition either. More than likely they’ll stay put for 2010 and probably 2011 which potentially takes a possible buyer out of the equation for other sports 2.0 startups. At a macro level this is exciting news as Citizen Sports crosses the finish line first for Sports 2.0 startups. The fact its a noteworthy buyer and its Bay Area company that will stay in the Bay Area is also cool. I also like the fact that Citizen wasn’t a company that had a great concept and just guided its way to a great acquisition. The company had a different name, a totally different strategy, and didn’t get anywhere meaningful for years. In just under 2 years they shifted course, put down the foot on accelerator, made some savvy acquisitions, developed innovative products, and now find themselves with a great exit and now absorbed by the largest digital sports company in the world. Disclaimer– I consulted at Watercooler Sports for a good chunk of 2009, a company that competed with Citizen Sports on some levels. Its kind of relevent, but mainly disclaimers make you sound ethical and point to the fact that you’ve done things in your life. Disclaimer- 21 was an okay movie. I think Hollywood twisted the story a bit too much. BenKoo.com is a sports, technology, and entertainment website and is to be used for informational and entertainment purposes only. Copyright © 2017 www.BenKoo.com - All Rights Reserved - Trademarks used herein are property of their respective owners.